Pearl Hale was born in New Hampshire in 1867. She arrived in Eureka Springs, Arkansas with her parents, as a young unmarried woman, in the late 1880s or early 1890s. At that time Eureka Springs was a health resort town of cold water springs. Apparently she had recently received her medical training. It was said, though not verified, that she was the first woman medical doctor in Arkansas. 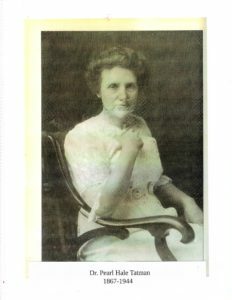 She is listed in Polk’s Medical Register and Directory of North America of 1904 as a medical doctor practicing in Eureka Springs, AR. As a woman she had difficultly establishing a medical and surgical practice among several male doctors in the resort city, but soon won the respect of the people with her compassion as well as her skills. Opening an office on the Duncan block of Spring Street she soon became known as Dr. Pearl, a name she carried the remainder of her practice in the city as well as throughout the hills and hollers around picturesque Eureka Springs. Dr. Pearl took many of the area’s maternity cases and other women’s conditions as her special interest. She was on call at any hour to go to surrounding country homes for deliveries. A very early, and apparently short term, position she held was physician and surgeon for the Tunnel Company for the M and N.A. Railroad. Dr. Pearl spoke at the 1906 National Eclectic Medical Association meeting. When Albert Tatman returned to Eureka Springs as an M.D., Dr. Pearl shared her office with him. Eventually they bought the building as well as other property. An article in the Daily Times Echo from Eureka Springs stated, “Cozy Corners is one of the pretty properties of the city, and is owned by Dr. A. E. Tatman and Dr. Pearl Tatman. This enterprising couple, besides enjoying a large practice own their own substantial stone office building, the upper story of which they use as a residence and several cottages that are fitted with all modern conveniences.” Cozy Corners was their second residence well known for hosting gracious social life. The two doctors took part in the literary and drama society that often met there. Dr. Pearl and Dr. Albert adopted a little orphaned girl named Daisy. Daisy grew to become a prominent citizen of Eureka Springs. She and her husband, Clyde Perkins, with the help of citizens including the Drs. Tatman raised money for a city playground later known as Harmon Park. When Dr. Pearl died Cozy Corners, and all her other city property, was be-quested to Daisy. Dr. Pearl remained in the charming Cozy Corners house after Dr. Albert died in 1925. Later she acquired rural property on Onyx Cave Road. It was on this farm that she lived her last years. The several hundred acre farm was left to Laura O’Conner, a young woman who had lived with Dr. Pearl for several years, though she was never adopted. The many stories of Dr. Pearls’ life-long, continued and compassionate care for people is the most often expressed memory of this unusual, early, woman doctor. One story: “Dr. Pearl delivered a baby to a mother who was in dire need of clothing for the new baby. When the twins arrived—the good doctor went to the home of one of the clerks of Walker Bros. Store, got her out of bed—-went to the store [and bought] the necessities for the new babies. [She stayed up all night sewing baby clothes.] When the doctor made her return trip the next morning, she took along the much needed clothing for the babies as well as sheets and blankets for their use.” Dr. Pearl often took some of her own sour and jelly to the families. Another story happening early in her career: A tunnel was being built by Italian workers. They were not accustomed to the harsh winter cold. The male doctors in town refused to go in the cold to care for them. Dr. Pearl was asked if she would go. She said “yes”. She rode her horse t the railroad camp over rushing icy streams, on rocky mountain trails for several weeks. The men survived and the tunnel was finished on time. In the late 1920s Dr. Pearl fell on the ice and broke her hip. Thereafter she walked with a cane yet continued to practice medicine. There are records of delivering babies in 1928 and July 14, 1937; one news item indicates in 1940 she was working 20 hours a week. Dr. Pearl died of pneumonia at age 77 on April 20, 1944. She had practiced medicine more than 45 years. She is buried at the IOOF cemetery in Eureka Springs, Arkansas beside her husband.